When preparing to buy a Djembe, it's important to determine the type of sound you're looking for before you start shopping. After reading the info in this Djembe Buying Guide, you'll be able to make a clear and confident decision about which drum is perfect for you. Djembe drums were introduced to the world through West African dance. The traditional hand drum was, and still is, used to hold the beat and signal choreographed moves in ceremonial and celebratory dances, weddings, funerals, and other rites of passage. 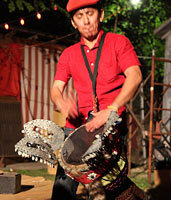 The djembe is also known for its call and response patterns allowing communication between players. The translation for the word "djembe" is quite fitting and beautiful, meaning "everyone gather together in peace". Players tend to gravitate to this drum for that very reason; to enjoy fellowship with others in a relaxed, welcoming environment. 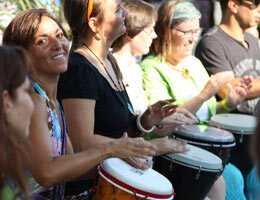 Some holistic health practitioners and West African healers utilize the djembe’s resonance in their work with patients. Blacksmiths in West Africa were the first to craft this drum. The process of creating the djembe to playing the djembe was a spiritual one. The Blacksmith would make an offering to the trees he cut down in order to make the instrument. It is believed that each djembe contains three spirits: that of the tree, the animal whose skin covers the drumhead, and the spirit of the djembe’s maker. It is believed they should come only from Guinea, Mali, Burkina Faso, Sierra Leone, and the Ivory Coast as these locations contain the tree the djembe was originally carved from. Due to tourism, however, it has become popular in Ghana. Many tourists go to Ghana to train with drum masters and like to return home with the drum as a souvenir. It wasn’t until the 1950’s that African drums began to make their way to the US and Europe. The popularity was due to Nigerian percussionist Babatunde Olatunji who released an album, “Drums of Passion,” in 1959. Though the album didn’t feature the djembe, it aided to the spread in popularity of African drums. 1959 was also the year Les Ballet Africains was first performed in the US. This dance company featured traditional African dance and drumming including the djembe and helped to popularize the instrument. Drum masters made the move to the US and Europe beginning in the 1950’s, when the use of the djembe began to spread West. Researchers from Europe and the US also spent time in Africa to learn about and master the art of the djembe. In the 1980’s and 90’s, the Djembe became fully popularized in Western culture. This was due to the expanding popularity of Les Ballet Africains, as well as the growing appreciation for world music. Today, the djembe continues to grow in popularity as can be seen with its use in popular music. Musicians such as Paul Simon, Vampire Weekend, and U2 have all ingrained the drum in to their unique sounds. 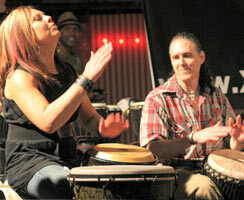 Drum circles and their connection with the spiritual aspect of the djembes has also aided in the popularity of in the US. The djembe has a distinct shape resembling a large drinking goblet; a large bowl on top that is covered with a leather skin or other synthetic material as the playing surface and a slender stem for the sound to resonate. A standard size drum measures approximately 24-25 inches in height with a drum head that has a diameter of 12-14 inches. These sizes do vary considerably with the inclusion of kids drums, travel drums and oversized bass drums, but if you are planning to take a class, most instructors will require you to have a standard size so you can learn to play all of the notes properly. The playing surface requires tuning much like a guitar, snare drum or any other instrument. On traditional drums, the tuning is accomplished using a rope tightening technique that is completed by hand. The distinctive shape of the djembe is designed not for aesthetics but for tone and resonance. The interior of the bowl allows rich bass notes to develop before making its way down the stem where it is amplified. The inside of the shell also has grooves cut into the wood in a special way that also enriches the sound quality. Any alterations in dimensions and the size difference between the bowl and the stem will have a significant impact on the tone of the instrument. Djembe drums are traditionally carved from a single piece of solid hardwood. African mahogany, iroko, and lenge wood are all excellent materials to use in this regard; Siam oak is a common substitute for drums made outside Africa. The age and strength of the wood plays an important role. Stronger woods mean that the shell can be carved thinner without sacrificing durability which results in better sound quality of the drum. A drum crafted from young, softer woods tend to produce lower quality sound. Today we see many players enjoying what we call “modern djembes”. These are drums that look and sound like the traditional African drum but are made of synthetic materials. Players seek out these drums when they want extra durability, a brighter tone or in some cases a less expensive option. Modern djembe shells are made from a range of materials including plastic, fiberglass or Acousticon to name a few. The drum heads are often synthetic as well, made from a form of mylar material altered to feel, look and sound like goatskin. These drum heads sometimes feature a modern tuning system where bolts are tightened to increase the pitch of the drum similar to tuning snare drums. As we noted earlier, the djembe is used often in popular music, especially with the merge of pop and world music. The djembe has been used with such prominent acts as The Beatles. 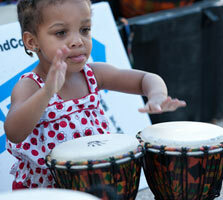 Today, many classically trained drummers are expanding their kits and percussion sections to include the djembe. Sometimes, it isn’t played the traditional way as we have seen with indie band, Yeasayer, and others. The drum is sometimes played with mallets to get a bigger sound (this is especially beneficial to rock bands). Many think the djembe has gotten away from its spiritual roots and want to keep the instrument rooted in its past. Some also believe if the instrument was not made in Western Africa, it is not a proper djembe. Each drum holds a different spiritual and musical connection for its player. Though we don’t have djembe healers in America, their healing power is still present as people use the African drum to relieve stress. This has a positive effect on the heart, and we can see this instrument can still heal from within. Though the classic instrument’s use has changed over time, each djembe player, new or advanced, is rooted in the values and traditions of the past and adding to the future of this unique instrument.